Recently I ran across a message board post requesting recommendations for historic horror novels. The first thing that crossed my mind was Les Daniels’ Chronicles of Don Sebastian, a series of five novels published by Ace and Tor in the late 70s and early 80s. I have an old paperback book rack where I keep and display vintage paperback novels and after pulling out my copies realized I only had four of the five. 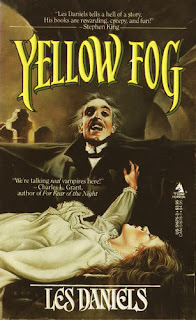 I logged onto eBay and within a week I had a brand spanking new copy of Yellow Fog. $4.00. Gotta love eBay. It came at the right time. I was between books and ready to read something short and sweet so I dove right in, knocking off this 300 page paperback in a few days. The vampire Don Sebastian de Villanueva first appeared in The Black Castle (1978) which takes place in 1496 during the Spanish Inquisition. 1979 saw the publication of The Silver Skull which finds our anti-hero in 16th century Mexico. In Citizen Vampire (1981) he appears in France in 1789 during the French Revolution. Like Hammer’s Dracula, you can’t keep a good vampire down, not even an evil one. Don Sebastian resurrects once again, this time disguised as spiritualist Sebastian Newcastle, in mid 19th century London, England. Yellow Fog tickles my Gothic bone in more ways than one. Daniels’ writing is exciting and evocative, much like a Hammer horror film come to life. It is a heady brew of drawing room séances, grave robbing, necromancy, and the ever present fog which chokes the streets of London by gaslight. Unlike the earlier novels, the final installment, No Blood Spilled, is a direct sequel to Yellow Fog, opening with a descriptive passage in a Victorian insane asylum before transporting the reader to Calcutta, India, where Sebastian joins forces with a cult of assassins who have sworn allegiance to Kali Ma, the Goddess of Death and Destruction. Though long out of print, a recent survey of eBay showed a number of the books in the series readily available at affordable prices. Daniels writes assuredly about the various histories he explores, but his books never fail to be quick reads which chill and thrill and most of all entertain. 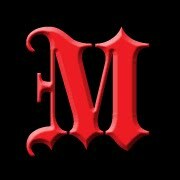 Lovers of vintage Gothic Horror will not be disappointed. I've got a handful of these, but haven't read them. Glad to hear they're so good! Sadly, Daniels died just at the end of last year. I figured this one would attract your attention, Will. I had great fun reading Yellow Fog. Sorry to hear that Daniels passed on. I understand there was a sixth book planned but never written. It seems that the cover artist used Mexican actor German Robles for his photo reference of the vampire. German Robles did a couple of Mexican vampire movies in the 50s and 60s.